Games such as Solar Flux rarely hold my interest for very long, so I was very surprised when I found myself in the last few levels of this 82-stage game. 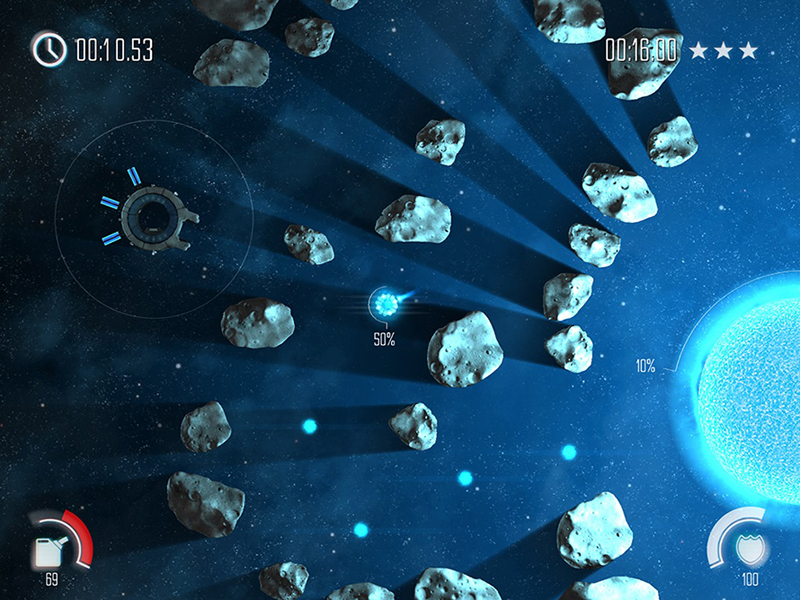 Solar Flux is a space-themed action puzzler not all that unlike Angry Birds or Cut the Rope where you have objectives for each stage and are rewarded with skill stars the better you do. Here you’re saving dying stars by shooting plasma into them. You collect this plasma with your ship, which has limited fuel and which cannot get too close to the stars without the risk of exploding due to the loss of its heat shield. A fun physics system plays a part in this game which has you holding orbit around planets, coasting around space while trying to use as little of your fuel as possible, hiding behind planets to avoid the intense heat of the stars, and riding the solar waves of the stars as you restore energy to them. The game’s visuals are gorgeous for a game of this kind and the music is great, definitely feeling appropriate for the environment. The colors of the celestial objects are vibrant and stand out nicely. The music is soft and gives you a feeling of solitude as is fitting with the environment. Nothing looks or sounds cheaply done. All in all, the game isn’t terribly difficult if you’re only interested in seeing each level. If you’re after a full clear, achieving three stars on each level, you have a big challenge ahead of you. In most of these games, you only have one thing in mind: collect all the things or kill all the things with as few flying swine as possible. 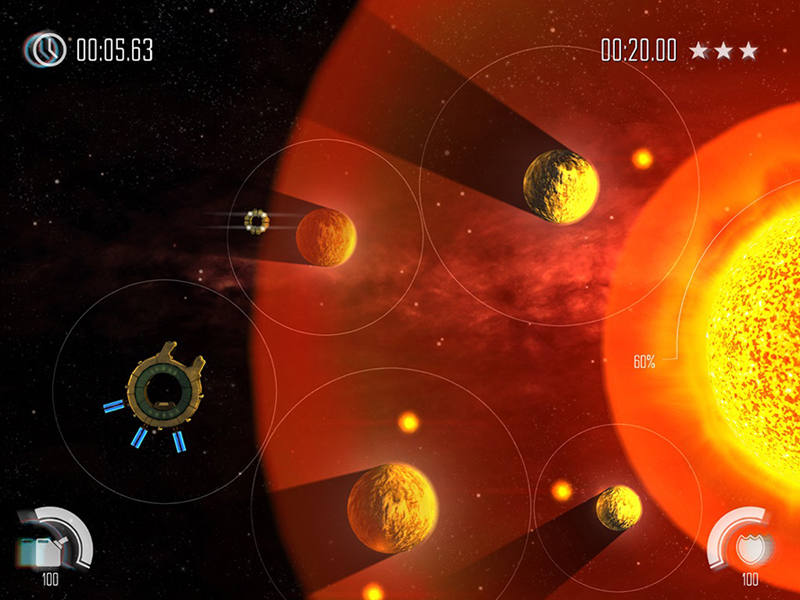 Solar Flux adds some variety and asks you to perform different tasks for various stages. The game may challenge you by requiring you not to use much fuel, not to lose X amount of your heat shield, or to complete your objective within a time limit. I zipped through the stages, having only an occasional hang up that took more than a few tries to get around. The graphics are rather pretty, and I felt that the game makes good use of the controller, even though the tooltips suggest one use the keyboard. I decided to try out the mobile version on my Nexus 5. The download is free; however, you only get a few stages at a time, and you MUST complete all of the stars for what few stages you do have in order to advance. Ads appear between every few missions, but at only a dollar to remove them, it’s worth the price if you find you like the game. Coming from the PC version to this was incredibly difficult due to the controls; movement of your ship isn’t as intuitive as it is with the controller. It took quite a bit of practice to get the hang of it, but eventually things became fluid. Between the two versions, I think the desktop version is the better choice both because of how it’s easier to control and because you don’t need to collect all three skill stars in order to advance. However, I do suggest trying out the mobile version first since it’s free. Think of it a trial version. If you enjoy this type of game, I recommend picking this one up. Should you be one who is not into puzzlers, skip it as there’s probably nothing here that will change your mind. Solar Flux was developed by Firebrand Games. “Space,” it says, “is big. Really big. You just won’t believe how vastly, hugely, mindbogglingly big it is. I mean, you may think it’s a long way down the road to the chemist’s, but that’s just peanuts to space, listen…” – Hitchhiker’s Guide to the Galaxy on the subject of space. Solar Flux has earned has been awarded the Indie Gamer Team Seal of Approval by Miko.